This past Tuesday, January 27th, Cincinnati City Council's Strategic Growth Committee gathered at City Hall to listen to and review construction updates on the long-awaited Banks development project. David L. Holmes, Assistant City Manager and John F. Deatrick, Banks Project Executive were both on hand to explain the project's progress in further detail. 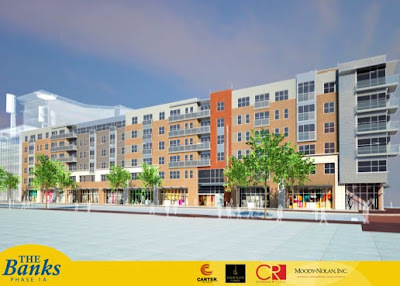 The update focused on Phase 1a of the construction plan, which includes 300 apartments and nearly 80,000 square feet of retail and restaurant space with parking garages below street level. As of this January, Phase 1a is 65% constructed and staying well within the budget previously set for the development. Both the City of Cincinnati and Hamilton County have pledged monies towards The Banks. The City has pledged $20 million and has so far paid $7.5 million, while the county has committed some $5 million. After both the city and the county have paid their committed shares, they will split the remaining cost 50/50. Phase 1a of The Banks is projected to open by Opening Day 2011. According to the presenters, apartment leasing will begin in fall of 2010, though the projected price points of said apartments are still up in the air. As soon as the exterior facades on the buildings are finished, the streets that are currently closed off due to construction will reopen. The scope of construction that has been most recently completed is mostly structure for parking and mechanical, electrical and plumbing infrastructure. They are currently laying shear walls and columns in the south site by the bridge. The workers are waiting for warmer weather to come back in order to pour more concrete. One of the financial directors gave an update on the amount of local, small business, minority and women employees and businesses currently engaged in the Banks project. She emphasized that 74% of construction workers for the project currently live in the Cincinnati metropolitan area, 20% are minorities, and 2.5% are female. Council members Charlie Winburn, Laure Quinlivan and committee chair Chris Bortz expressed concern for making sure that "as many Cincinnatians as possibly are involved in the construction and in the business of the Banks." Winburn stressed making sure that "this project has the utmost integrity" when it comes to keeping money local, (despite hiring out of Birmingham for the general contractors). After Phase 1a is complete in early 2011, work will begin on reconstructing Mehring Way to cut a wider arc above the river, bordering the new Central Riverfront Park. As a result, project managers are currently in the process of appropriating stimulus funds for this development. 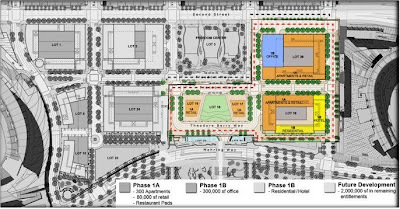 While retailers for the Phase 1a portion of the project are not yet set in stone, much has been speculated about a potential grocery store, entertainment venues like an ESPN Zone, and other restaurants, bars and entertainment venues to compliment the evolving riverfront district. 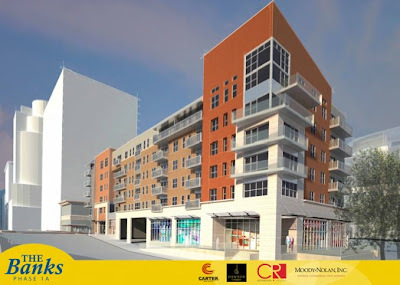 Connectivity to the existing Riverfront Transit Center, and proposed Cincinnati Streetcar, will help connect The Banks to the rest of Downtown, Over-the-Rhine, and Uptown neighborhoods resulting in a live/play/work situation that will be attractive to all. Interesting, I actually didn't expect phase 1a to be done by early 2011. Any word on how much of the space will be dedicated to new restaurants? Is that really what it's going to look like. It looks like that new SCPA building. A bit of an eyesore if you ask me. Why not do Italianate architecture? Courtney, the officials at the meeting only mentioned 80,000 sf for restaurants and retail. I think it will be a case of first come, first serve. Katie, while the idea of Italianate architecture is nice, it is difficult in this day and age to replicate the past. It is costly and the materials and skilled laborers simply are not what they used to be.